So the good folk over at Letsrun.com are doing a survey on the believability (or suspicion – is your glass half full or empty?) of the running world records in Track and Field. Pop on over and have a vote – you select which of the world records you believe are clean or dirty. It will make for an interesting analysis. It’s also stimulated some good discussion at The Science of Sport’s Twitter page, and so I’ve converted some of that in my thoughts here for a quick post. First, let’s compare men to women. As I was going through the survey, it’s fairly obvious there’s a default “dirty” response to any records set in the 1980s. That’s particularly true for women’s athletics, and so I dug up an old analysis and updated it. Below is the table showing the ages of selected records for both men and women (in years and days). I’ve also added a column that shows how close the best performance over the last four years has come to the record, as a percentage. Women’s records are almost twice as old as men’s records, with an average age of 21.9 years. Nine out of the 14 analysed records date to the 1980s, and the oldest records are for women’s 800m and 400m. Two women’s records have survived since the 90s (both to Chinese women, powered by turtle blood, which has clearly lost its effectiveness since then. They must not make turtles like they used to), and three date back to the 00s. None have been set so far this decade. On the men’s side, only one record has lasted since the 1980s, that of discus thrower Jurgen Schult. A lot more men’s performances were “born” in the 90s – six in total, and the 00s contribute four records, including the long distance track records (Mo, fancy a shot? ), and Usain Bolt’s short sprint records (which also fell within a week in 2008). That leaves three records this decade – Merritt in the short hurdles, Rudisha’s London 2012 performance, and the youngest record in the family, Kipsang’s marathon performance from Berlin last September. If you look at the column furthest right in each table, you’ll see a comparison for how close the best performance in the last four years (five seasons) has come to the record. On the women’s side, the 400m, the 1,500m and marathon WR are the least threatened among the running events, but it’s in the field that records are way out of reach. Nobody has come within 12%, 7% and 5% of the records in Discus, Shot put or Long-jump, respectively. It’s similar in the men’s events – the field event athletes have been further off their records, hovering around 3% worse since 2009. In the track events, there are a few 0% (that’s where the WR has been set in the last 5 seasons), and others are in the 1%-2% range (by way of illustration, this means that the current 1,500m times (1.59%) are around 3 seconds off the world record. The 5,000m times (1.69%) have been 12 seconds off Bekele’s WR. So, clearly the 1980s were the golden era, particularly for women’s events. Some of those records are highly unlikely to be broken in my lifetime, unless the effect of doping without detection can once again be increased. Some, incidentally, have fallen – the 4 x 100m women’s relay record fell in London (which provides cause for understandable doubt, it has to be said), and the 100m hurdles record is within sight thanks to Brianna Rollins’ 12.28s performance last year (ditto on the doubt). For a really interesting illustration of what was going on there, consider the graph below, redrawn from a paper by Yorck Olaf Schumacher in 2009. It shows the best performance and the average of the top 10 performances in women’s discus from 1960 to 2000. You’ll see the progressive increase, which co-incided with the development of synthetic anabolic steroids and the systematic doping programmes that we know existed, predominantly in eastern Europe, from the 1960s onwards (If you have a look at the owners of the world records in the table above, you’ll see the mostly common origin). Then in 1987, out-of-competition doping controls were introduced, and suddenly athletes had to become a little more subtle with their doping. They didn’t stop, but they had to time it better, because for the first time, there was a potential downside to doping. The result was that 25 years of progress suddenly ceased and performances were set back to around a decade earlier. That was a greater than 10% decline, almost instantly. This is an important story, for a few reasons. 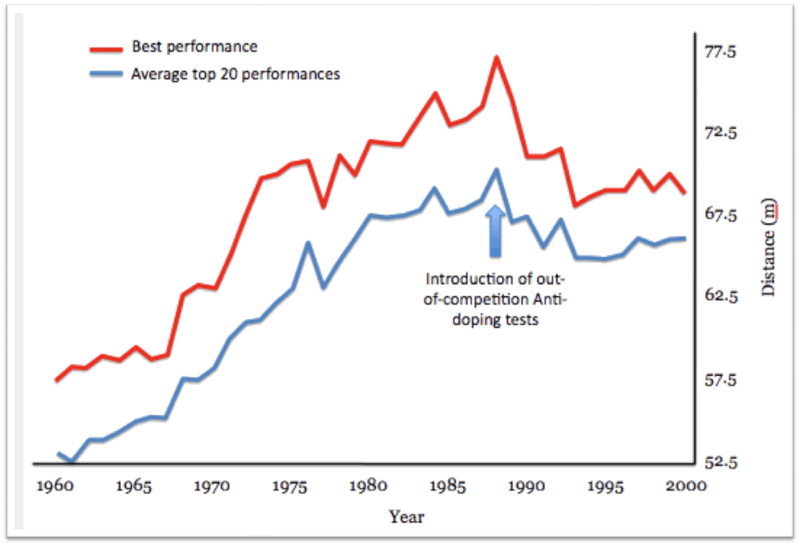 One, it shows you just what was happening in the 1970s and 1980s, and gives some degree of explanation to the table I discussed above – those performances from the 1980s are, in my opinion, the result of the doping practices of that era, and it’s not surprising that they are largely untouchable. Doping moves performances beyond the realms of possibility – it takes women’s performances and pushes them out 10%, to a point where it is no longer possible to match them without androgenic assistance. The same is true for men, though to a lesser degree, which explains why those records have since been broken. EPO and blood doping would do the same, incidentally. The second important message in this story is that the introduction of testing is effective when judged by performance. It is for this reason that performance analysis can be a useful guide to the effectiveness of anti-doping strategies. We have this debate every year in July during the Tour de France, but it remains true and I remain convinced that performance is a good guide to the state of the anti-doping game. That’s because doping controls can work without actually catching dopers, provided they act as a large enough ‘risk’ to change the behavior of the candidate doper. You see this in the graph above. It was not a completely successful strategy in this instance, because athletes with half a brain could fly under the radar and time their doping to avoid detection. However, subsequent advances, including retrospective testing, better resolution of testing, more testing and the biological passport concepts all aim to do the same thing – obviously to catch, but also to dissuade, doping. On that note, let’s see what the Letsrun survey shows, when we discover just how cynical those who follow the sport are. I suspect it will make for quite depressing reading! Remember to vote for your clean and dirty records here! The discussion continues over on Twitter, and feel free to post your views on whether there are any clean records on The Science of Sport Facebook page!